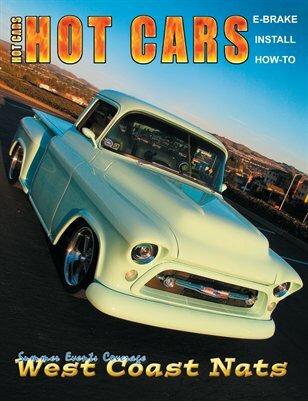 I had a great time putting together this latest issue of HOT CARS. I got to spend some time with some great people. I spent a Saturday morning in Stockton photographing Roger Lee’s dragster and talking with Roger about nostalgia drag racing and model car building. Two of my favorite subjects. Then I got to know Randy Thompson a little better as I spent a Sunday afternoon photographing his amazing truck! Randy DRIVES his truck! He told me some interesting road trip stories. I got to talk with Gary Campesi, an artist I meet through “The HUB’ on the internet. I’ve been a BIG fan of his art work and I’m really happy that he wanted to share his talent with our readers. Our project car gets a new E-Brake and Gas Pedal! Our summer events coverage is a special look at the Goodguys West Coast Nationals!